Balloon Jacket for Bike Riders!! Concept of air bags is common in 4 wheelers where it will inflates when something terrible happens. Bike riders till now is dependent on helmets itself, but helmets alone cannot guarantee your life in major accidents. For this reason the concept of air bags is remodelled to a new design named 'Safety Sphere'. 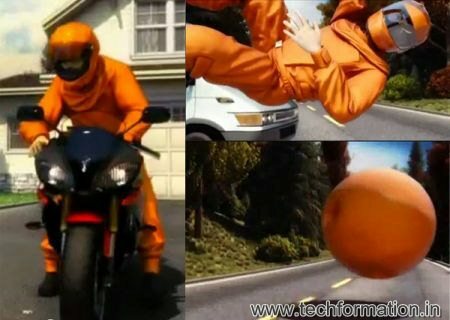 Biker must wear this suit while riding. When any accident happens, it will inflates into a sphere ball with in fraction of seconds providing safety on the spot. On the flip side, this concept did not explain the situation of the rider after the sphere is formed. He might roll down the streets! !